Have you used your keyword (phrase) into your URL? What's more? is the URL correct? You can transform it when the post is in draft. Once the post is published you can't change it anymore. H1 is for the title. H2 is to use only once for your keyword. H3-H6 For all other subheadings. Don't use them all. Choose one for all your posts. 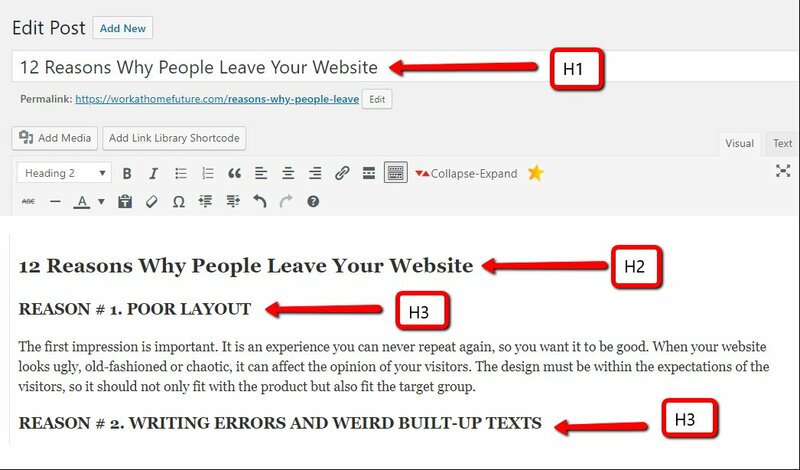 It's recommended by Kyle in the training to use the H3 subheading only. need to relate to the next paragraph beneath your subtitle. Try to wrap your keyword phase into an eye-catching title for your post. There are multiple title generators available, here are a few. The length of the title is the best between the 40 and 70 characters. Appearance of your keywords in the content. Keep your content relevant and use your keywords wisely. Attempt to fit them in naturally. Try not to constrain the subject. Is your content written as though you where conversing with a companion? Try to fit in something personal, an anekdote or experience. Utilize your keywords in various way. Google will perceive this when crawling your post. Your keyword phrase: Make an excel sheet for your used keyword phrases. Never use a keyword phrase twice. Use for every post a new keyword phrase, is your keyword phrase unique? I never known that I can submit my post's URL to Bing. I thought that I can only submit my homepage's URL. Thank you Loes for this great training! If my post is indexed, can I still change the Title? if I change it, do i need to fetch it again? Yes you can change the titles, however, it's not sensible when the post is ranking, never change the url, write a new post when you are not satisfied about An URL, and leave the old post as it is. Can i add a featured image for Amazon affiliate products review? I have few posts about Amazon product reviews during my free member days (just one week Premium) but I do not add one because I read a post in here that it might violate Amazon terms and conditions. Hope somebody can clarify this. All in one and in perfect chronology. It is a timely help from you and you will come to mind with your training every time I write a blog. Should I consider synonym as another keyword? I think it should be but I like to make sure. That is a profound thing, Loes.Thanks. WOW! this is the most helpful information I have ever read! Thank You for putting this all together in one easy list! Great training on systemising your content writing, thank you. Thanks, Loes. I always wonder what I forgot when I hit publish. Now if only I can remember to practice this, I do not have a dedicated office/ place to work so can't print and post. But, great post and thanks! Already on my third notebook. Haining trouble carrying them around.LOL! This is very helpful. I was wondering if there was some kind of checklist we could use - and lo and behold you created one! Another checklist (and I've started creating one for myself) that would be valuable is one for creating a new website here on WA. When I created my second one I missed some steps, because I was an awful note taker from the training and my memory was a bit faulty. This is good thank you. Thanks for the training Loes,This was good for me, I learned quite a few new things here. There were a few things I didn't understand, I assume I will come across them as I continue the training. Thanks again and have a good day. Good morning Loes, I hope that you are bright-eyed and awake? As usual awesome post. You are amazing. Your mind must work 24/7! You are a walking book of knowledge! I thank you for that, I will keep it in my favorites my dear friend! I am looking at my first post and scared stiff! lols! Lol. We all experience that when we look back:) You are certainly not alone in that! Good! Nice to hear I'm part of a club! lols! You are such a wonderful teacher! And I am so grateful! I had NO IDEA the H1, H2, H3, had a meaning.. I will print this checklist and use if from now on! Thanks again for all your time Loes!! Thank you so much for this. I have been working on a list of things o check before publishing and this ties in nicely with what I have done. As always, you are a step ahead of me. Thanks for sharing. I will keep this in mind with my training. Great checklist, Loes. I've bookmarked it for future reference. Like always, really helpful and informative tutorial, thanks for sharing Loes, you`re the best. Regarding 2) H1-H6 headings, you state: "H2 is to use only once for your keyword." ? Please explain that. When it is appropriate to use the main keyword in an H heading, use the H2. When the keyword phrase doesn't fit in a heading, I skip the H2 and only use H3 headings. It's not adviced to use the H2 heading throughout the whole content. This is a wonderful post full of amazing information. Thank you! I just noticed your comment on Loes profile about the 25 points. I have been writing all of this down on paper with pen in hand. That's terrific stuff. I need to bookmark this because I know I will be referring back to it often. Thanks so much. OMG Loes I did not know half this stuff. Thank you Thank you Thank you! Thank you for this info Loes! I am going to have to check it to see how many of my pages are complete with this list! Thanks Loes, just when I think I need to do some sort of checklist for myself up pops your training. I need to do some work on my images and alt text. I thought I read you should put your keyword in the alt text, and I have even if it didn’t really fit. Time for more training on images for me. Excellent training with lots of useful details! Thank you for putting this together, Loes. Your SEO is improving noticeably. Excellent training thank you very much for sharing and your work!! Thanks for that great post, Loes! Question regarding #12, though: "You can select a keyword in the post which attends another post. Have you done that?" - What does that mean? How is it done? Can you please elaborate? Take a look at the image with #12. You can see the word "Mobile-friendly"
I have another post on my website about mobile friendly, so I place a link to those two words to the other post. Thanks for your training post..I have the grammar, spelling, etc fairly well, but I don't think I am doing well in the other areas. Really enjoy reading your training, Loes. Wikipedia has put a nofollow on their links these days. Hi Loes, thank you so much. I appreciated most of all the paraphrasing tool that you recommended. Thanks Loes for great information - I've already noticed I've missed off some things on your list already. I will definitely bookmark and use on every post. Great training Loes. I don’t usually use tags as I’m sure I heard Jay say he doesn’t in one of his videos so I stopped. I may well return to them again. you've been busy.... now if you can teach me to write headlines maybe I'll get somewhere. Every beginner should bookmark this training! This training has been liked by 649 before today, I revamped it. This happened twice before. The say somehow an email gets marked as spam by a recipient and it's sent back to WA which flags the email account and shuts it down. it makes no sense. since most of the readers come from social media. It is a new irreversible trend. I do all those things every time. I just never realized there were so many checkoffs. Great Post as always Loes.